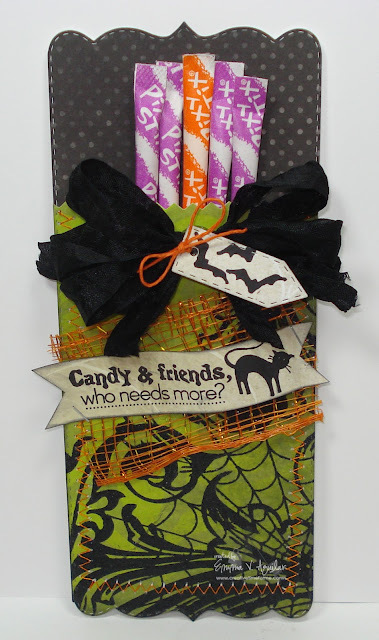 My Creative Time: Trifold Card Die TREAT POCKET! GOOD morning my creative friends! WOW! what a busy weekend! Let's get right to my projects! 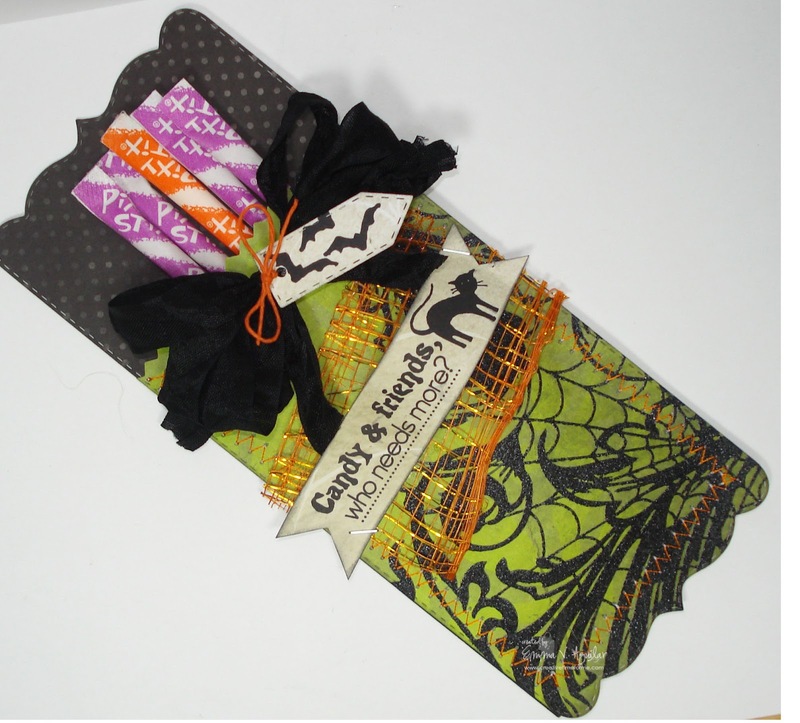 I was SO EXCITED to use my newest die the "Card Sentiments w/3x3 Fancy Trifold card die"! Inside of making a card, I made this super cute treat pocket! You can see in my video below EXACTLY how I made this one! My design team & myself ALWAYS love to show you different ways to use my dies & this is one of them! I also used my new "Treats for my Sweets" & all embellishments from "Liz's Paper Loft Boutique"! ribbon instead! I also ending up adding my die from the "Teeny Tag Greetings" stamp set & stamped the little bats that are from the "Treats for my Sweet" set! In this one the Pixie Sticks are just PERFECT! 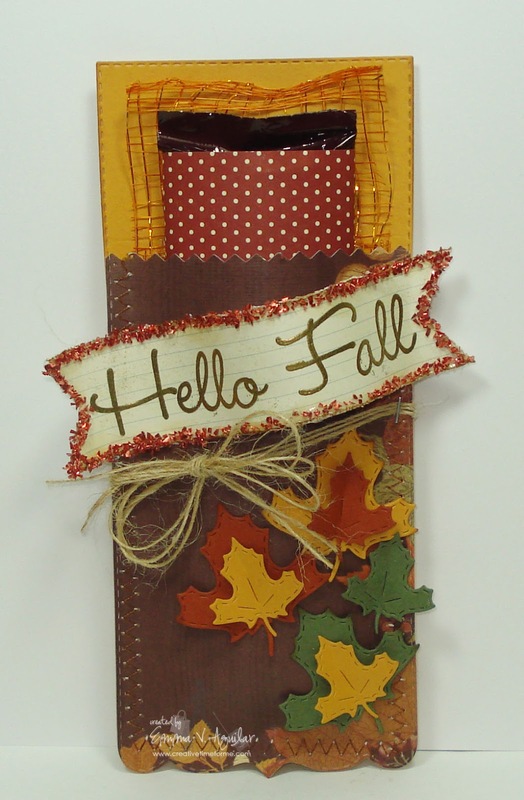 You can make this little pocket into SEVERAL different occasions, holidays.... the possibilities are simply endless! For my next one, I made the same pocket, but switched it up a bit, which you can see the difference on what I did in my video below! For this one I used my new "Piles of Smiles" stamp set which looks SOOO PRETTY on my little fall treat pocket! You can also fit a Hershey bar WITH ALMONDS in this pocket perfectly! 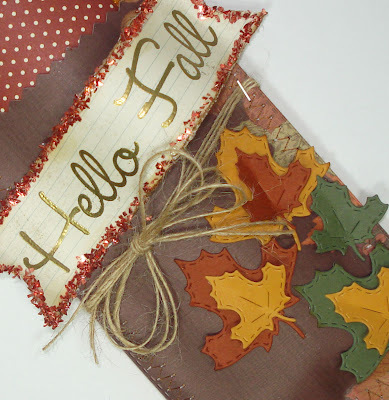 I used gold embossing powder & heat embossed my sentiment on the tag! All embellishments are from "Liz's Paper Loft Boutique"! 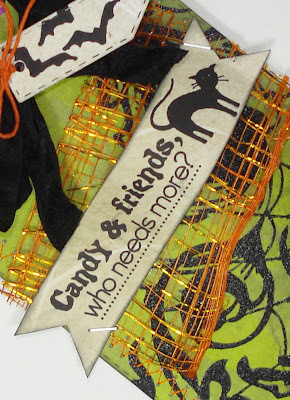 For this one, the twine is from Papertrey Ink! Here is my video on how I made these super cute treat pockets! I hope you liked my treats today!! First of all, THANK YOU for making this release such a HUGE success! I cannot believe you all wiped me out! We are working our best to get all orders out this week! That is so cute Emma and what a great idea!! I got my shipping notice this morning and can't wait to get my new stamps. These are awesome Emma!!! I am so excited to get my stamps and dies....just got a shipping order..you are AWESOME!!!! Thanks for sharing a GREAT project and Happy Monday!!! Emma this is such a super cute idea!! Just got a shipping notice too and am super excited! Please tell your Mom thank you so much! Thanks for sharing! Have a wonderful week! OMG, that die is so versatile! I love how you created these treat holders and those papers are AWESOME! Great video! 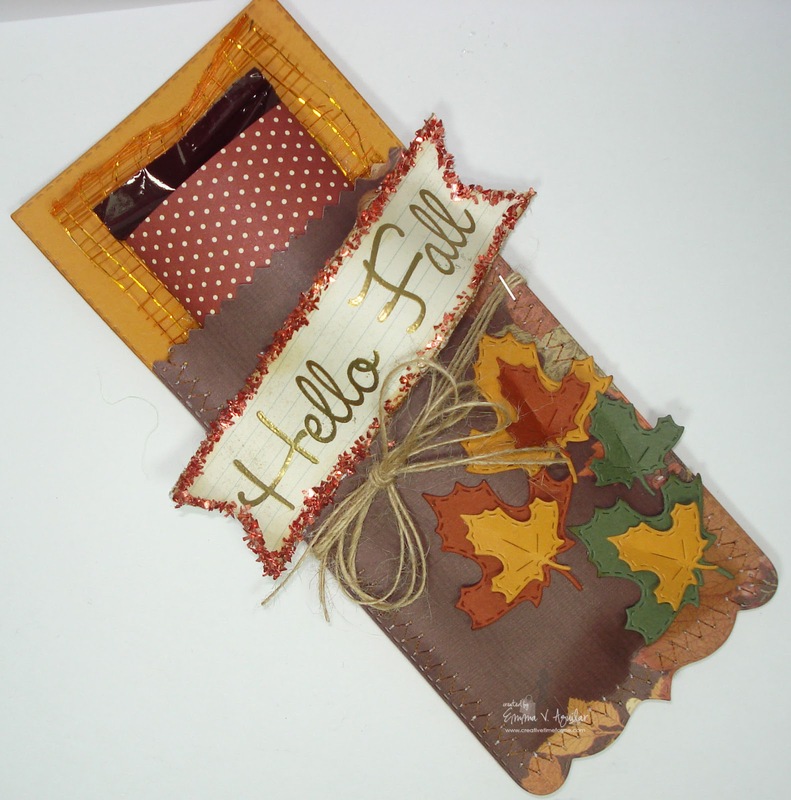 Love the various uses of your dies! Fantastic treat holders, thank you for sharing. You are so stinkin creative! I love that your back creating. Wish I could have bought your new release..it looked so awesome! I'm still looking for a job or something to make money from home....jobless for over a year now. :(. Oh well I know something good will be coming and then I can get your awesome dies etc. you take care and keep up the good work. Emma ~ OMG! Again you just blew my mind with these projects! I LOVE how versatile your porducts are! The papers, the details and of course the dies & stamps are just AMAZING!!! So CLEVER! Scraplift material written ALl over this too! I knew this last release was going to be a HUGE success! I can't wait to see what everyone else creates! Hey you have the BEST shipping department!!! Hi Emma! !I am SPEECHLESS......OMG! !This is so Cute!Yummy and so Fabulous! !Yes you are certainly back!! !Love it! Super cute! Will be stalking my mailbox for a couple weeks! Great video. Got my shipping notice so I'm looking forward to getting it soon. Hugs and a big thank you to Mom. first I wanna say THANKS so much to your Mother and to you!! She is awesome in getting our stuff out so fast! got my shipping email on Saturday!!! now, the projects today are so cute! can't wait to try this for myself!! so cute! Love this Girl! Can't wait to get my Happy Mail! Super adorable pockets! I love that gorgeous paper. I really appreciate all your videos too because they are so helpful :) I can't wait until I'm able to purchase all these goodies! And again, many congrats on the success of this release! When I heard so many sets sold old within the first few hours, I kept thinking, "WOWZA!!" HeHeHe. Emma, your releases are beautiful. What great releases you have this month (as always)! What a great project. You always have such fun ideas. I I look forward to your daily blog posts. Glad you are back and that your son is doing better. Received my shipping notice so will be running to the mailbox everyday after work. I can't wait to play with my new dies and stamps. A HUGE THANKYOU to you and your Morher for getting the shipments out so quickly. You are the best!!! A very clever idea to make treat holders...great idea! They turned out so pretty. Hugs to you and your Mom for all the hard work shipping! Super cute idea. I might have to look at getting a very small sewing machine! I love how you've been using it on your projects lately. Either of these would make such cute treats for my co-workers! Love this idea Emma! Nice job! Awesome idea Emma!!! TFS have a wonderful day! Oh My Goodness Emma... what a cute way to package treats! Way to use this Cute Die. Great Work Crafty Genious! FABULOUS IDEA!!! I've been trying to get here since Monday, now I know why I'm selling the thinner jute like crazy! lol! This us such an GREAT idea....I'm totally going to to try this. Thanks so much for sharing. Can't wait to get my goodies.